I’ve been working on a module for five players of the 5th level. I’ve been struggling with how I want to present it here and have decided to talk more about the technical aspects (pens, paper, scanners, software) and a bit less of the Dungeons and Dragons 5th edition (D&D 5e) choices that I’ve made. The goal here is be more concerned with illustrating the creative process and less concerned with the nuts and bolts of rules. After floundering around with several pieces of software to create digital maps, I finally tired of getting no where at all and ordered a pad of 11″ x 17″ graph paper with a 1/4″ grid. I prefer a larger pad so I do not feel quite as cramped and it affords me room to make notes as needed. It will be heavy on large-scale situational traps. It will be expertly constructed and of very fine quality. It will not have been penetrated or otherwise entered in more than 200 years, so most opponents will need to be undead, elementals, constructs, or otherwise be able to survive for long periods. Once we had a few ground rules, a handful of expectations and logical conclusions, things started to roll along much faster. The plot details initiated an explosion of directed, well-focused production. The more fuel you have on hand, the easier it is to get a creative fire burning. The plot details initiated an explosion of directed, well-focused production. Brainstorming, I developed a list of possible opponents that include Ogre Zombies, Flesh Golems, Quipper Swarms, a custom door greeter to set the tone, and a few other custom creatures once we get a bit deeper into this. It was more than enough to get started. It is worth mentioning that much of my creature planning is done on Kobold.club and I find this site invaluable. I also use open5e.com which is a great place for getting the specifics for each creature in an encounter, all without opening a book. Now I had something on paper and had a pretty good mental picture of how each of these rooms would work. As the map got more detailed, I considered how I wanted several traps to work and made diagrams for them (sketches seen in the recent post about traps and arbitrary player character murder.) 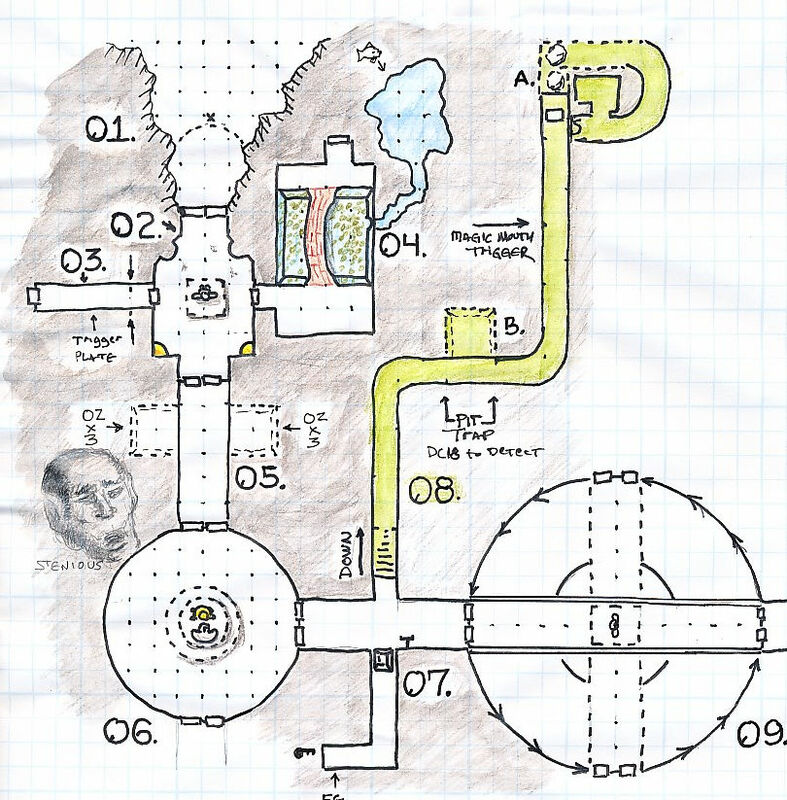 I feel that it is very important to set a tone early in the halls of a dungeon that give the players an expectation, a foreshadowing of what is likely to transpire as they advance through the dungeon. Of the first eight rooms, seven of them have traps. After this insidious introduction, they should be much more aware and studious in their attempts to locate and disarm any traps that they might encounter. Of the first eight rooms, seven of them have traps. I now had enough to start writing room descriptions. When finished, each room was taking up about 2 pages of paper, which I suppose was the price of having complex traps.. This added increasingly more detail for the map and I added notes or more detail to the sketch and fleshed it out a bit more. Because I was enjoying myself and wanted the detail to stand out a bit more, I colored the paper very, very lightly with watercolor pencils which I activated with a brush that was only lightly dampened. The paper is thin and has buckled, but it is a lot nicer upon the eye. Continuing forward… I will convert the hand-drawn map to a digital format with Fractal Mapper 8 – this is already almost done. Though the dungeon isn’t fully completed, the players have already arrived and have penetrated over half of the rooms.